If you need help with accounting in Singapore, turn to SBS Consulting. Our team will ensure that they provide you with simple, straightforward, and topnotch Singapore accounting service. We incorporate the latest software, most recent updates, and the best practices of the world of accounting Singapore. Though we prefer to do business with MNCs and SMEs alike, we like to assist SMEs with our small business accounting service. For the Singapore business owners, it is essential to know about the financial health of their enterprise. They can do so by regularly updating their books of accounts. The task is a part of the compliance responsibilities mandated by ACRA. Outsourcing it to one of the expert accounting services is a vital decision for the small businesses. 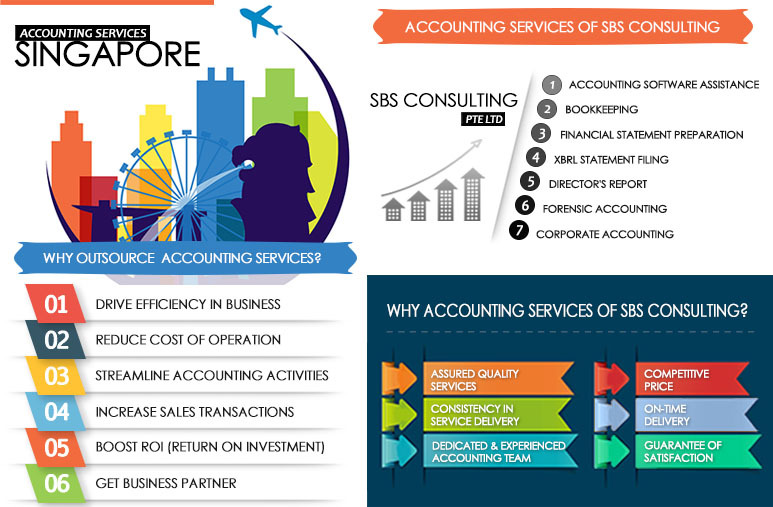 SBS Consulting is offering unprecedented accounting services singapore to SMEs and MNCs since a very long time. We specifically concentrate on fulfilling basic to manifold accounting requirements of business in Singapore, in compliance with the Singapore accounting standards laid down by the government agency ACRA (Accounting and Corporate Regulatory Authority). SBS Consulting is predominantly rendering the accounting and bookkeeping services Singapore along with other allied business services. The Singapore Accounting services are furnished to all business sizes and segments, including, small and medium enterprises to big, national and international corporations. The accounting services for small business of SBS have been designed for the small and medium enterprises so that they could reap maximum benefit from it. The range of SME accounting services we offer includes well-organized bookkeeping service which is the need of every SME in Singapore. We will offer our services by managing your accounting software, developing the charts of accounts for different companies, and the data entry services according to your company’s business. Following is a brief overview of the accounting services Singapore we provide. Accounting Singapore is gaining popularity with the growing demand for incorporation in the country. At the same time, one must understand that the market trend is in favor of appointing private firms offering topnotch services of exceptional standards. An accounting firm in Singapore provides its services through a qualified CPA (Certified Public Accountant) or account manager. He will be responsible for working with you on a one-to-one basis for your small business accounting needs. The account manager or Singapore CPA from the leading accounting firm will be completely responsible for reviewing and organizing the information provided by you for the accounts ledger creation and maintenance. Your role will be confined to supply all the necessary financial documents such as sales orders, purchase orders, and bank statements on a periodical basis. In accordance with the Singapore Financial Reporting Standards (FRS) that the government insists on, the account manager or CPA will help in drafting financial statements for statutory submissions. Hiring our efficient Singapore accounting service to manage the books of account, bring relief for the small business owners. Being one of the top accounting firms in Singapore, SBS relieves them from having to brush up their knowledge of accounting principles, which most of them lacks in and it also saves valuable time. Accounting services Singapore price of SBS is highly cost-effective in the market. The firm has touched a milestone of serving thousands of clients annually with its high-end quality services at an incredibly low accounting fee. Why Accounting Services in Singapore are Favored by SMEs and Big Businesses? Singapore accounting services are popular with the SME owners. The world over, these individuals are multitasking to make the ends meet. Sparing time for maintaining the books of account for their own business is not always possible for them. The firms, like SBS, that deliver services in accounting for small business, come to aid of these individuals. On the other hand, there are those big businesses that can afford to set up their own accounting departments, but, want to outsource their non-core accounting function to a reputable accounting service in Singapore. They opt for a specialist Singapore accounting service. Whatever the case, these firms offering services in specialized accounting do their task accurately and efficiently. In fact, they do a great job of managing your book of account as they are expert in doing it. Contact us, to know our services in accounting for small business owners and tell us, whether they match your needs. The team of accountants appointed by our Singapore accounting service would ensure that the services provided are to the point, customized, and best in class. All the activities related to accounting Singapore are compliant with the regulatory framework of the governing bodies. Outsourcing Saves Time: A business can choose to appoint offline or online Singapore accounting service. Outsourcing the task, a business owner can save ample time that would otherwise go in sorting through the files to find invoices and getting the financial statements ready. Outsourcing Saves You Money: If you establish an in-house setup, you will need to pay staff salaries and even contribute to Central Provident Fund (CPF). You will also need to deal with the human resources related issues. After outsourcing the task, you do not need worry about employees taking medical leave and you can even save on the performance bonus. Outsourcing gets you services of competent Accountants: Surely, you realize that the process of hiring and firing employees or dealing with their resignations is a painful task. The process brings about a headache to employers, and likely to take a long time (sometimes even months) before you could find a suitable candidate for the vacant position. In the event that someone leaves your firm, you will suffer from the interruption of work and workflow. Being one of the leading accounting firms in Singapore, we serve as a specialized accountant who relieves clients from the burden and stress of gauging numbers and keeping updated books of account. We ensure that our clients meet their compliance requirements as per the guidelines of ACRA. At SBS Consulting, our basic aim is to streamline the accounting process, improve efficiency and reduce the cost of compliance to our esteemed clients. Filing Financial Statement (FS) in XBRL format has been made mandatory for all companies in Singapore by ACRA, be it limited or unlimited by shares. Due to this statutory obligation, businesses prefer to outsource their financial reporting activities to the accounting firms specialized in XBRL filing in Singapore. Over the years, XBRL services of SBS Consulting has gained recognition from clients for its unmatched services and professionalism. You can count on our expertise. Precisely, the compilation of unaudited financial statement is meant for a private company (designated as a SMALL COMPANY) that qualifies for audit exemptions in Singapore. It gives the business an outlook on its financial position. A compiled financial statement entails cash flow statements, balance sheet, director’s report and comprehensive income statement. Given its importance, it is a necessity rather than a choice for the Singapore businesses. Forensic accounting is a process wherein a specialized accountant utilizes their skills of accounting, auditing and investigation to examine and assess the financial statements of the companies. This is a systematic method to reveal the truth underlying corporate fraud, mismanagement, whistle-blowing, crime, employee negligence and bribery & corruption. SBS Consulting offers high-end and customized forensic accounting services to its clients. A Director’s Report is a fair presentation of a company’s financial state. The Singapore-based companies are required to submit it as a part of their audited or unaudited financial statement and annual report with ACRA. A true Director’s Report helps the business build credibility among the stakeholders and creditors. Thereby, every company must take measures to prepare a true and authentic Director’s Report by appointing a reliable accounting firm like SBS Consulting. Accounting services for corporate are as essential as for SMEs (Small and Medium Enterprises). Earlier, big corporations tend to have their own in-house accounting departments. But, gradually, the trend has been changed because of various factors. Now, they prefer to outsource their accounting needs to the third-party firms. Keeping in view the growing demands, SBS offers its services in corporate accounting in Singapore. Professional accounting services in Singapore is the most widely acceptable option for the locally based companies due to the presence of stringent laws and regulations of Singaporean authorities. The chances of a business getting penalized for being a defaulter of the law is very common in Singapore. Thereby, the majority of local companies opt to use the services of professional accountants or the third-party firms to avoid any legal implications. The professional accounting services of SBS cover every aspect of accounting and bookkeeping for them. For Businesses, one of the easiest ways to comply with the stringent laws of authorities is to get well-versed with the prevailing Singapore accounting standards. SBS Consulting presents a handy guide on accounting standards such as International Financial Reporting Standards (IFRS), Singapore Financial Reporting Standards (SFRS) for its clients so that they could understand the SFRS for small entities in detail. With the help of this guide, a business can avoid nuisances of non-compliance in Singapore.